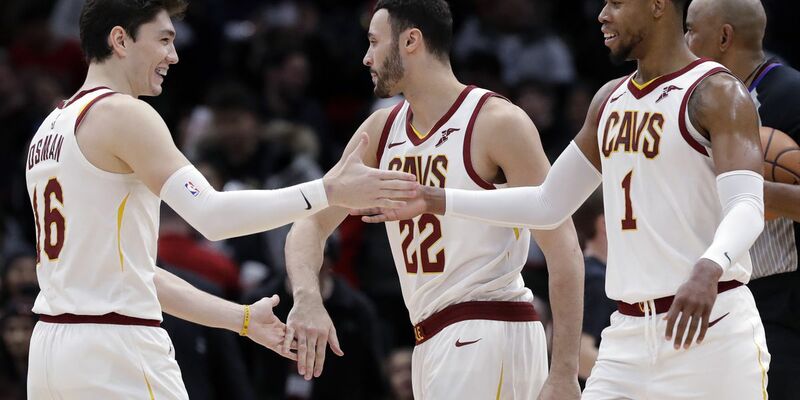 CHICAGO (AP) — Jordan Clarkson and Alec Burks each scored 18 points, Cedi Osman added 17 and the Cleveland Cavaliers ended a six-game losing streak, rallying to beat the Chicago Bulls 104-101 on Sunday. Lauri Markkanen led Chicago with 21 points and 15 rebounds, and Zach LaVine had 17 points and 12 rebounds. The Bulls have lost three straight and 13 of 14. Hood had a follow basket with 17 seconds left to put Cleveland up 102-101. After a Chicago miss, Dellavedova hit a pair of free throws to close out the scoring. LaVine missed a 3-point attempt at the buzzer. Chicago had just one field goal in the final 3:50. Cavaliers: F Larry Nance Jr. was scoreless in 17 minutes off the bench in his second game back from a sprained right knee. ... Cleveland let go G Cameron Payne after declining to sign him for the remainder of the season. Payne's second 10-day contract expired Saturday. He averaged 8.2 points and 2.6 assists in nine games with Cleveland. Bulls: Rookie F Chandler Hutchinson will be sidelined for at least a month with a fractured bone in his right foot. Hutchinson will be in a walking boot for two to four weeks and will be reevaluated following next month's all-star break. The 22nd pick of the 2018 draft has played in 44 games (14 starts), averaging 5.2 points and 4.2 rebounds in 20.3 minutes. Hutchinson was injured late against the Atlanta Hawks on Wednesday night, but thought it was just minor soreness. He practiced the following day and had a career-high-tying 12 points and a career-high 12 rebounds in 41 minutes two nights later against the Los Angeles Clippers before the injury was discovered. "You play a whole game, you think just some ice, some stim and treatment and you'll be good," Hutchinson said. "To have to be out for multiple weeks is kind of a bummer."